Earning an online master’s degree in multimedia design can turn a hobby into a thriving career. Students who love to draw, design, and doodle can use their natural talents to become well-paid professionals. Graduates can become art directors, animators, or advertising managers. These professionals impact American culture and earn significantly higher salaries than the average of $37,690 for all occupations. According to the Bureau of Labor Statistics, marketing managers make an average of $132,230 per year. With steady growth in the industry and the consistent development of groundbreaking technology, now is a great time to enter the field. What Else Can I Expect From an Online Master’s in Multimedia Design Program? Based in Hamden, Connecticut, Quinnipiac’s master’s degree in multimedia design is a highly customizable 30-credit program that students typically complete in two years. In addition to three core courses, students earning the MS in interactive media and communications complete seven courses from a selection of 15 electives. Courses cover topics including social media, web design, and analytics. Students can complete an independent study or an internship to gain valuable work experience. During the capstone course, students receive guidance on developing and packaging their portfolio of web work. Applicants must have a bachelor’s degree in any field from a regionally accredited institution. Applicants must submit an online portfolio, two letters of recommendation, and a personal essay. Quinnipiac University is regionally accredited by the New England Association of Schools and Colleges, Commission on Institutions of Higher Education (NEASC-CIHE). The MS in graphic information technology at ASU requires 33 credit hours and each class lasts 15 weeks. This multimedia design master’s degree challenges professionals in the graphic information field to develop advanced administration skills. Students in the online program complete the applied project track, which includes 18 credits in a technical area of emphasis, nine credits in a supporting area, three credits in research, and three credits in an applied project. The school offers six start dates per year. Applicants must have a bachelor’s or master’s degree in computer or software engineering or a related field and a 3.0 GPA. Applicants must submit GRE scores and a statement of purpose. Because multimedia design is a broad area of study, students should carefully research each prospective program. Learners should first identify their career goals. For example, students who enjoy hands-on work with design techniques may wish to become art directors or animators. Meanwhile, learners who want to oversee big picture ideas may excel in management positions. After students choose a path, they should look for online programs with relevant coursework. Students who want to become animators should ensure their programs offer courses in animation with the newest technology. Similarly, potential marketing managers may prefer programs that emphasize management and leadership courses. Future art directors should look for programs that balance the technical and business aspects of multimedia design. Students in programs without planned specializations often create their own niches through elective courses. In addition to available concentrations and classes, students should consider program requirements such as portfolios and thesis projects. Because a master’s degree is a significant investment, students should only apply to programs with regional accreditation to ensure employers and other institutions will recognize their degree. Each student’s multimedia design master’s degree is unique. Learners customize the degree through thesis projects, portfolios, concentrations, and electives. However, some classes are relatively common requirements for students earning a master’s degree in multimedia design. 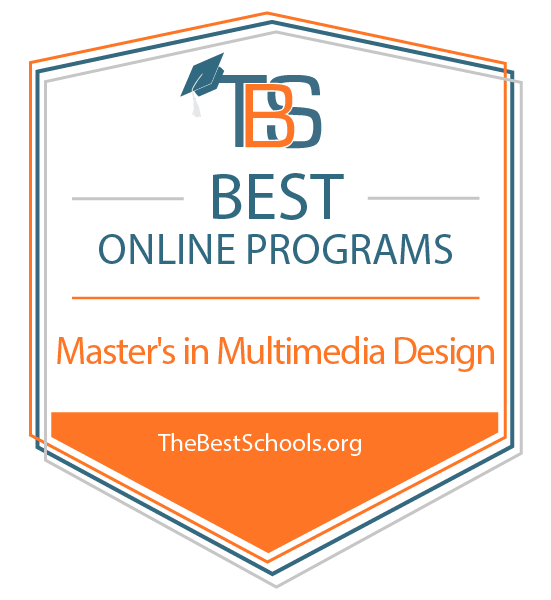 Below are some of the most common courses in graduate-level multimedia design programs. Students explore branding to prepare to design projects for corporations. Students learn how to create a brand with fonts, colors, and design rules. Students build on knowledge of design principles and learn to make their creations more effective. This course covers theories and research that prompts learners to think critically about design. Students learn to create designs that work across a variety of mediums. Learners gain technical skills to make campaigns for websites, mobile apps, television, billboards, and flyers. Students discover aspects of an effective design and learn how to demonstrate the value of their work to clients. Learners create return-on-investment reports and gain analytical skills. Many master’s programs in multimedia design culminate in thesis projects that can span several semesters. Students conduct research, analyze data, and publish a report on their findings. Graduates with a master’s degree in multimedia design can turn their passion for design and media into leadership careers. Some graduates become art directors and manage teams of graphic designers. Others work as marketing managers, who oversee account executives, writers, and design professionals. Graduates who do not want to manage others often become animators. These visual design professionals work for agencies, television studios, newspapers, and magazines. They oversee the look and feel of each brand they manage and ensure consistency. A master’s degree can help candidates develop the leadership and design theory skills they need for these positions. These creative workers can produce art for animation studios, television stations, films, or video game productions. They use cutting-edge computer programs to create engaging designs. While some employers only require candidates to have bachelor’s degrees for these positions, specialized master’s degrees can help professionals land the most coveted jobs. Marketing, promotion, and advertising campaigns often have many moving parts. Copywriters, graphic designers, media buyers, and account executives work together to produce the final product; these managers oversee these projects and professionals. Master’s degrees can provide necessary management skills and technical knowledge.